After releasing iPad mini, jailbreaks were working very hard and very fast to jailbreak the new tablet and the have already succeeded to do it but this jailbreak won't be available for public soon as usual. MuscleNerd is calling this a [ failbreak ], a term used for that type of jailbreak which is only reserved for developers so they can find new exploits with it for developing untethered jailbreaks. Let's read more about the jailbreak status until now. 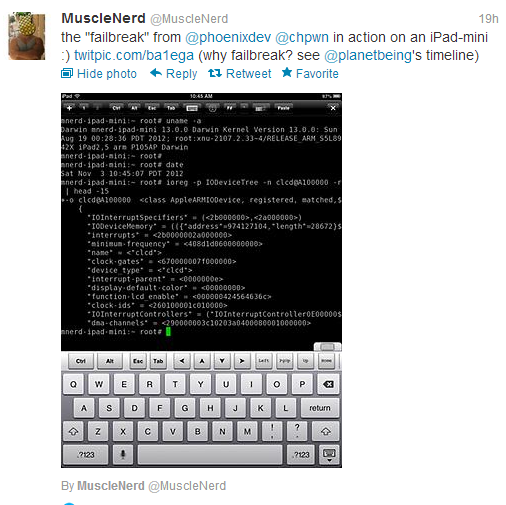 Just a few days ago, MuscleNerd also managed to bypass iPhone 5’s security and jailbreak it but it was reserved as a failbreak, and this time too, MuscleNerd has used the same exploit to jailbreak the iPad Mini. Let’s Wait And See What Will Be Next Days. Don’t Forget To Stay tuned With Us On Our Facebook Page, Twitter Page and Google + Page and We will Report You with all Jailbreak Updates and News.